When George Clooney came to my house for dinner and I gave him a chocolate bacon bar for dessert, he suggested serving it to vegans and not telling them the source of the salty sweetness, since no one should be deprived of this culinary experience. We don't advocate that, but at your next carnivore-only dinner party, do try out these bacon-for-dessert recipes, given to TIME by some of the best chefs in the country. Cut the crust off brioche. Cut brioche into 1-inch cubes. Spread them in a shallow pan and set aside. Mix the remaining ingredients, using an immersion blender. Strain the mixture and pour over the brioche, mixing well. Cover in plastic and refrigerate overnight. Grease a square pan and lightly sprinkle the bottom with sugar. Place the brioche mixture into the pan in an even layer, about 1½ inches thick. Sprinkle the top with sugar. Bake in 350° oven for 20 to 30 minutes, until golden brown. In a 3-qt. saucepan, melt the butter over medium heat until it becomes light brown. Whisk the brown sugar, maple syrup and heavy cream into the butter and bring to a boil. Add the bacon and vanilla extract. Using an immersion blender, mix sauce until bacon is in small pieces. Strain the sauce. To serve, cut the bread pudding into squares or rectangles. 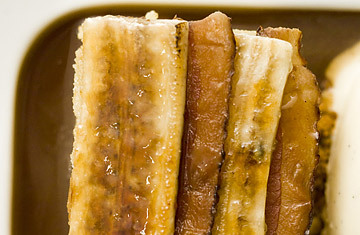 Top with a layer of fresh banana slices and sprinkle a thin layer of sugar on top. Use a torch on the dish to caramelize the sugar. Cover with sauce. Watch TIME's video "Bacon Chocolate Bar." See the best recipes using Spam.